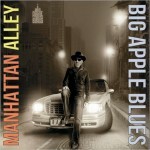 Share the post "Album review: BIG APPLE BLUES – Manhattan Alley"
Big Apple Blues is a band on a mission. It’s all there in the name and also on the noir front cover photo, in a new take on funky, soul filled, jazzy blues fusion and instrumental music. In contemporary parlance it’s roots music framed by a jazz lineage that draws on New York’s Tin Pan Alley’s rich musical heritage to lever us into an album of the highest quality. And if the band’s previous album ‘Energy’ set out to conceptually get inside the vibrant hub of a day in the Big Apple, then ‘Manhattan Alley’ takes that same vibe to delve deep into the influences that shape the music of five virtuoso players and special guests who match them all the way. It’s very much an organic project from the live in the studio recording to the connection between the Manhattan environment and the way it influences the band’s contemporary style. Big Apple Blues constantly search for a groove, as they subtly jam out evocative, soulful, and vibrant songs that explore a full range of emotions. To that end, the album is top and tailed by two uplifting tracks – the ironically titled ‘Got To Start Somewhere’ and the exuberant bookend of ‘Rock On’. But BAB is a jam band with a big difference. They pour all their creative energy, elemental chops, spontaneous deep grooves, sharp riffs, effortless changes and focused solos into a conceptual blender. The end result is an instrumental hybrid with a familiar pull, but counter-weighted by a visceral contemporaneity. The liner notes point to a sense of ‘universal consciousness’ in the context of the soulful Jim Alfredson B3-led ‘Deep Talkin’. Built on a Barry Harrison tic-toc groove, Chris Eminizer’s sax gives it a late night after hours feel. What they are alluding to is simply the process of creativity. Big Apple Blues’ musical knowledge was already evident in their role as a celebrated blues covers band. And if ‘Energy’ provided them with a major step in the direction of their own template, then ‘Manhattan Alley’ is the sound of band evolving, as they look to the future via the old school notion of generating spark and creativity live in the studio. There’s also a keen sense of fun and wonderment, two very rare commodities in a bunch of experienced hands. Keyboard player Jim Alfredson shifts from layered sounds to ground shaking solos, while Zach Zunis’s sculpted solos rise above a peerless rhythm section of Blues Hall of Fame inductee Barry Harrison and the relentless groove of bassist Admir Hadzic. Hadzic also provides the catalyst for the music from his cloying bass lines to the skeletal outlines which the band is all too happy to colour on an intricately played album. Curiously there’s hardly any discernible harp from Anthony Kane, but special guest Chris Eminizer adds some grainy, wide-rimmed sax tones on the opening ‘You Got To Start Somewhere’, as well as significant sax squalls on the more sombre ‘SDW’ and the thematic sax line on the outstanding ‘Love As I Know It’. Fellow guest Kevin Jones also adds an integral propulsive percussion on both the evocative ‘Hudson Breeze’ and the equally aptly titled ‘Subway Rumble’, suggesting that once both players were invited on to the session they became equally inspired as the core band members. And it’s the essential interplay that makes ‘Manhattan Alley’ more than just a blowing album. Listen for example, to the punchy uplifting riff of ‘Happy’, complete with Alfredson’s Booker T nuance, or to the way the band comes together on the back of Zunis’s stinging guitar line and Eminizer horn stabs on ‘Take Two’, as they eventually settle into a Hammond-led groove with a perfunctory ending. There’s a similar feel to ‘Steamroller’, full of Zunis’s spiralling guitar on an arrangement that obliquely references the Ian Dury’s ‘Hit Me With Your Rhythm Stick’ riff. Best of all, is the aching melody and soulful feel of ‘Love As We Know It’, which creates a tension that cries out for an expressive vocalist, but the gap is filled by conversational solos from Zunis and Alfredson on guitar and B3 respectively. ‘Manhattan Alley’ is full of little intricacies that reveal themselves with each play. The themes, riffs, grooves and solos are refreshingly an integral part of a song rather than the result of an endless jam. Indeed, on tracks such as ‘Take Two’ and ‘Hudson Breeze’, the band head for the fade all too soon, suggesting they were paying painstaking attention to the bigger picture of the album as a whole. This entry was posted in ALBUM REVIEWS, ALBUM REVIEWS (Mobile), All Posts, INTERVIEWS, Radio interview and tagged Admir Hadzik, album, Anthony Kane, Barry Harrison, Big Apple Blues, blues, Blues Hall of Fame, Booker T, Chris Eminizer, funk, fusion, Ian Dury, interview, jazz, Jim Alfredson, Kevin Jones, Manhattan Alley, review, rock, soul, Tin Pan Alley, Zach Zunis. Bookmark the permalink.